Dense, fudgy organic brownies made from Belgian chocolate with 74% cocoa solids for maximum richness. A thin layer of crispness on top, and dark, velvety insides studded with chocolate chips. Eat as-is with a mid-morning coffee, or warm gently and top with ice-cream and berries for an easy decadent dessert. Store in a cool, dry place for up to 7 days or freeze on the day of delivery. Defrost in the fridge overnight before eating for the best texture and flavour. 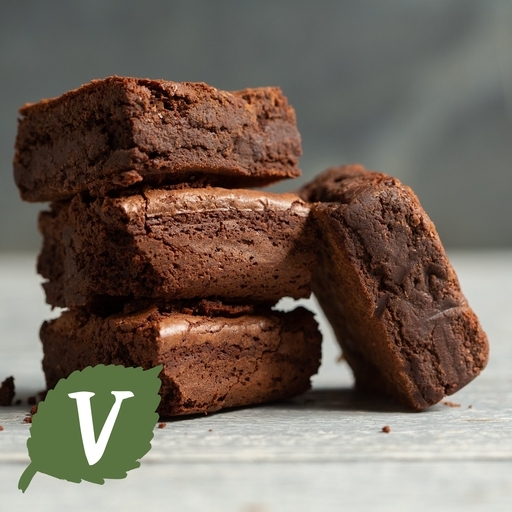 Crosbies is a family company that specialises in baking from scratch using the best quality fresh natural ingredients. Their chocolate brownies are their signature dish and contain more than 40% pure dark chocolate. They've made an organic version specially for us. Chocolate (45%) (cocoa mass (67%), cocoa butter (7.9%), vanilla powder), butter (milk), sugar, eggs, self raising flour (wheat, raising agent (sodium bicarbonate*)), coffee.